Here’s another entry in my "kitchen table world travel" recipe series. I love cooking recipes from other cultures. Today we’re going to Poland! Poland is always a wonderful place to go to "virtually" peek into people’s kitchens. The history of Poland has so many cultural influences that have made their way to the table you never know what you're going to find. Poland has a population of about 38.5 million people. That’s 3.5 million more than in all of Canada. To put it in perspective, Canada has a population density of 3 people per square kilometre; Poland has 120 people. That's pretty crowded in comparison. Today, more than 98 percent of Poland's population is ethnic Poles, with small pockets of Ukrainians, Belorussians, Germans, Slovaks and Lithuanians. At the start of WWII, there were also 3.3 million Jews in Poland. About 35,000 survived. All these people left their marks on Polish food and culture. But influence isn’t all inward. The Polish language is the most widely spoken language among Slavic people after Russian, and is also spoken in Ukraine, eastern Lithuania and western Belarus. The history of Europe – and who controlled what country when – is a headache to try to keep straight as anyone who remembers their history classes understands. This ebb and flow had great impact on the cultures and cuisines of all European countries. This is true of all Slavic peoples. I love Slavic food. It never disappoints in being filling, hearty, healthful (for the most part) and homey. Poles love family and friends and celebrate the sharing of their food. Also, for many Poles, dinner isn’t dinner without pork. This recipe has pork coming at you from three different directions. 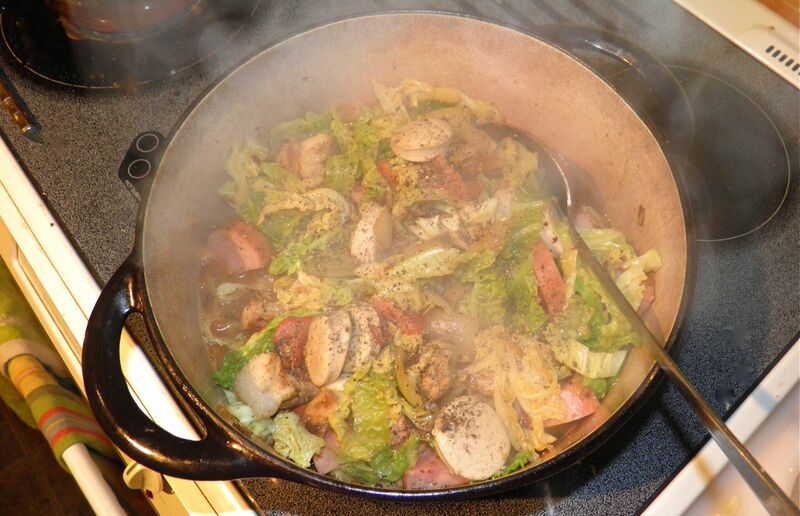 And also one of the cold weather crops so common around Polish hearths – cabbage. Some recipes for this stew use sauerkraut, some do not and others use both. I have opted for savoy and vinegar. If you wish to have your stew more sauerkraut-like use the 1/2 cup; if not use the 1/4. I used the 1/2 cup. This dish was wonderful, especially on a cold evening like last night. 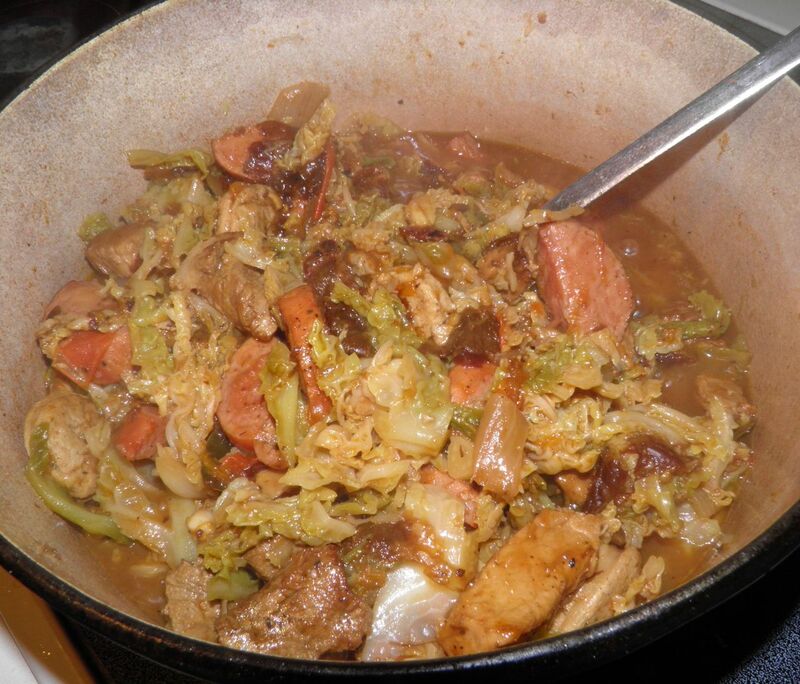 The smell was amazing and we could hardly wait for the 45 minutes stewing time to pass. As you can see from the pictures this looks like a homey meal. 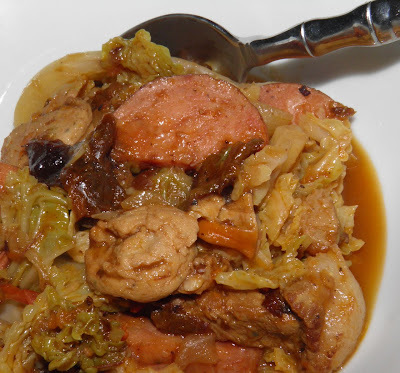 You can tell that it’s Polish by the combination of the spicy kielbasa, the sweetness of the prunes and floral notes of the bay leaves. This may take about 1 hour in total to make, but it’s an hour well worth the wait. Make sure you have enough crusty bread to stretch the stew into second bowls, because you’ll need it. Heat the oil in a heavy bottomed pot, like a Dutch oven. Add the cubed pork and cook until it begins to brown. Add the onions and garlic to the pot and cook for a further 3-4 minutes. Shred the cabbage and add to the pot. Stir and let cook for 2 minutes, until it starts to wilt. Add the dried mushrooms, breaking up any overly large pieces. 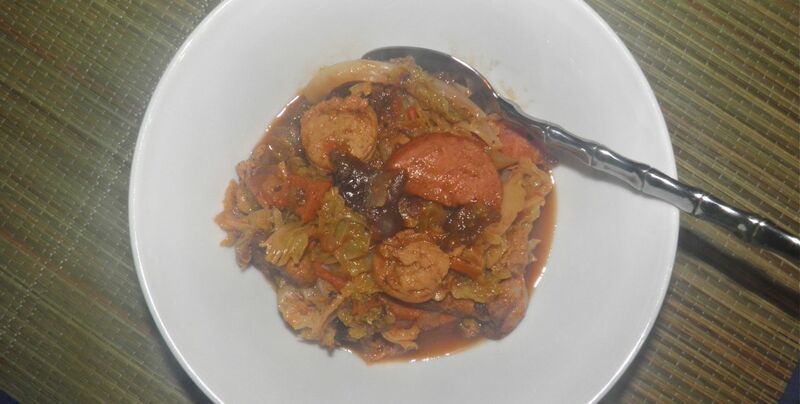 The stir in the tomatoes, kielbasa, sausage and the prunes. Stir in the vinegar and wine. Add the bay leaves, pepper and salt. Cover, lower heat to medium low, and let cook for 45 minutes. Stir occasionally. At the end of cooking time taste for salt and adjust. Remove the bay leaves and serve with crusty bread.